[Extinct Town] Built in 1890 and named for the old community of Apalachia, this station served as the maintenance headquarters for the Old Line Railroad between McFarland and Copperhill. Southbound trains used the railroad siding at Apalachia Station as a "doubling track." When a train was too heavy to climb the mountain, the crew would leave part of the train in the siding, take the rest of the train to Farner, and then return to Apalachia to pick up the remainder. Apalachian Power House [depicted here] was built in 1953 by the Tennessee Valley Authority to provide hydroelectricity to meet the demands of aluminum production during World War II. Huge pipes called "penstocks" supply the power house with water sourced 8.3 miles away at Apalachia Dam. [Extinct Town] The post office was established in 1895. With the coming of the Old Line, McFarland served as a section headquarters due, in part, to its proximity to the "W," a series of switchbacks that required additional maintenance. The town grew in support of the railroad workers, adding a general store, post office, and two-story hotel [depicted here]. Locals referred to the hotel as the "Government House," as it was often filled with forest service personnel working the newly created Cherokee National Forest. In time, McFarland was abandoned. [Extinct Town] In 1908, the Prendergast Lumber Company built headquarters for its massive logging operation at Probst [depicted here], one mile up river from Reliance on Big Lost Creek. At one time, Probst was comprised of more than 25 company buildings, such as the commissary, office buildings, and living quarters for management. Loggers, though, did not live in Probst. Some lived in surrounding communities and walked to work each morning. Others lived in hastily built shanties, scattered up and down Big Lost Creek. The reported population of the town was reported to be 200 in 1911. White settlers came to this mountain farming community shortly after the Cherokee Removal and began to thrive with the coming of the Old Line. 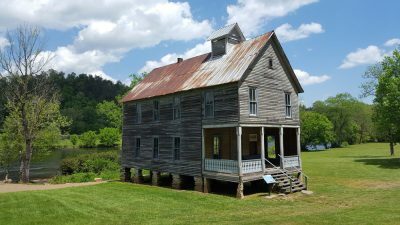 In 1891, a frame cottage was built for the railroad watchman whose job was to watch for and extinguished burning embers on the Hiwassee River bridge. Today, the Watchman's House [first picture depicted here], Joseph Vaughn's Farmhouse [second picture depicted here], Higdon Hotel [fourth picture depicted here], Webb Brothers Store [last picture depicted here], and Hiwassee Union Church [third picture depicted here] are part of the Historic District of Reliance, listed on the National Register of Historic Places. The store is open seasonally. The Higdon Hotel was built circa 1890. The Hiwassee Union Church was built around 1899. The bottom floor was used by the Hiwassee Union Baptist Church and the upper floor was used by the Reliance Lodge No. 636, Free and Accepted Masons, which was organized in 1906. The Watchman's House has been restored and is open for vacation rental, and the church is available for weddings. [Extinct Town] Austral was located where the Gee Creek Campground now is located. About 1905, the Tennessee Copper Company established the company town of Austral to mine quartzite. Use of quartzite in copper smelting was short lived, and the settlement closed around 1922. The ore was shipped over the Old Line to the Copper Basin for use in copper smelting. Austral consisted of eight dwellings, the Sullivan Place (a large boarding house), a depot, commissary, barn, and post office. The post office was established on January 20, 1908. An interpretive marker describes an ancient fish weir that is located in the Hiwassee River, just off the boat dock at the Gee Creek Campground. When the water is low, the V-shaped stone formation is easily seen in the riverbed. However, the Hiwassee River fish weir is missing a section that extended to the riverbank, most likely the result of boaters and swimmers who did not recognize the arrangement of stones as an archaeological feature. [Fort Marr] The original fort was built on the Old Federal Road (near the Tennessee / Georgia state line) in the early 19th Century. It was used in 1838 to detain Cherokee Indians prior to their forced removal on the Trail of Tears. Time erased most of the fort's structures, but the blockhouse survived and was removed first to Benton, Tennessee and then to the grounds of the Hiwassee/Ocoee Scenic River State Park.